I finished reading Fear to Tread by James Swallow Friday night. As I powered through the book something dawned on me. Sanguinius was just as doomed as those of his brothers who embraced the ruinous powers. I say this because the flaw that plagues the Blood Angels in the 41st Millennium not only plagued them in the 31st Millennium but pulled at their father’s will also. There’s also a profound psychic bond between him and his sons which explains an awful lot. We know that the Emperor deliberately experimented with different types of genetics to produce profoundly different results. The wulfen qualities of the Space Wolves was not an accident. There’s also a mention of vampiric genetic markers which can only belong to Sanguinius. Which indicates the red thirst was intentional. The black rage, however, seems more uncertain, but the potency of the red thirst seems connected with it. The Blood Angels were all psychically in tune with Sanguinius. He felt their pain and vice versa which is why his death at the hands of Horus doomed the Legion (and later the chapter/s) to a long and degenerating end. But Sanguinius’ death and the mental decay of his sons isn’t the tragedy. Nor is their capacity of unchained blood letting that would rival Angron’s dogs. Angron was abused and he, in turn, abused his sons. The Space Wolves were made to be loyal and ruthless and do what must be done. But the Sanguinius was created flawed by his father. On purpose. The fury within him and all his sons was put there. The black rage may have been an accident or a byproduct of Sanguinius’ journey through the warp, could be the psychic bond but I doubt it. It’s too neat and tidy to be an accident. It seems immensely cruel of the Emperor to create a Primarch so fundamentally flawed from the outset as to crave blood as inevitably it would only end in one way. Although it’s important to point out that (a) he bred the Primarchs for war and (b) although he was their father he was never a parent. Theirs was never intended to be a loving, nurturing relationship although that’s not to say the Emperor didn’t love his sons. In his own way he most certainly did. But had Sanguinius not been killed by Horus, although thanks to his farsight he always knew it was a possibility, then there’s every chance he and his legion would have been brought to account eventually for the conduct of a Blood Angel who succumbed to The Flaw. Such a genetic instability would no doubt be scrutinised and possibly deemed too high a risk to be allowed to live. I suspect Sanguinius always knew that which is why he did his best to be beyond reproach amongst the High Lords of Terra, his brothers and his father. And what of the legion post crusade, had the heresy not erupted? It would be interesting to determine if the Blood Angels could have coped without the continual promise of war to keep their minds focussed. And what place could Sanguinius have in Imperial society? Especially with so many of his brothers suiting the obvious and vital roles with Vulkan – it has been very strongly suggested – to take the Throne should the Emperor choose to step down. But, of course, the heresy did happen and it set the Blood Angels on a journey that would lead to them treading the red path. However, because of the bond Sanguinius had with all his sons, I believe they were on a dark and dangerous path already which would have only got worse as betrayals were revealed and Sanguinius witnessed and felt his sons being killed by those they once called brother. This anguish and rage would equally be felt by his sons essentially created a psychic feedback loop that would only increase in time. 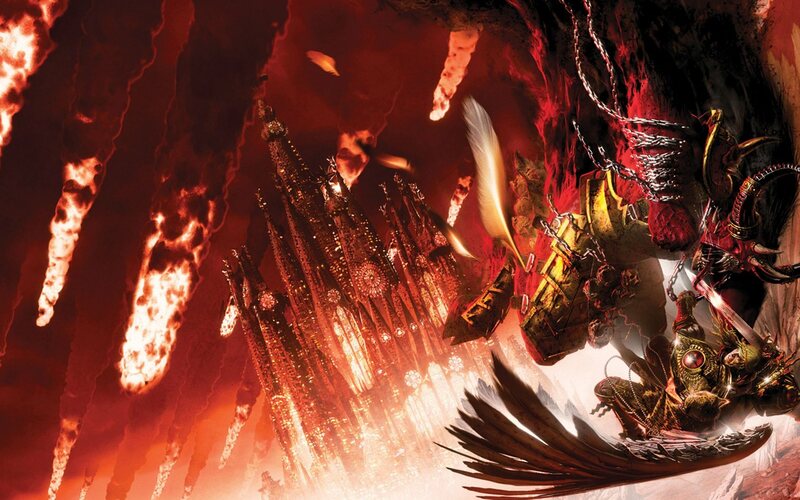 Had Sanguinius not perished the Blood Angels would be so hate filled their path would almost be identical. But the tragedy of all this is that Sanguinius knew it all. He’d seen it. He knew every outcome. His death, his survival but at the head of a legion driven mad by treachery, or an existence without the driving focus of war. All ended in the demise of the Blood Angels one way or another be it madness or at the point of a gun. Yet Sanguinius continued to fight in the name of an Emperor that had, potentially, only ever created him and his sons as a short-term measure – one that had no place in the Imperium the Blood Angels was helping to forge. But he did so for love and loyalty. Perhaps he thought that by pushing his Legion as hard as he did he was not only buying time to discover a cure but also hoped to prove the Blood Angels worthy to be a part of the Imperium. I think in reality it’s because Sanguinius was a good and dutiful son who loved his father and would do whatever was asked of him, even if it was at the cost of his Legion. And in the fires of war he gave his sons focus all the while slowly edging them towards the very fate they would daily try to avoid.